Left to right - MetaOptima's co-founder Dr. Majid Razmara, MetaOptima's co-founder Dr. Maryam Sadeghi, Skip Capital co-founder Scott Farquhar, Skip Capital co-founder Kim Jackson, AirTree Ventures founder Daniel Petre. Vancouver, BC, July 4, 2018--(T-Net)--MetaOptima Technology announced today that it has raised $8.6 million CAD ($6.5 million USD) to expand its advanced dermatology and skin cancer imaging and management software, DermEngine™, into global markets. This marks a key advancement in the way skin cancer is screened, detected, and managed. MetaOptima's proprietary products, DermEngine™ and MoleScope™ mobile dermoscope were developed not to replace, but to assist healthcare professionals and the patient screening ecosystem at every stage. Capturing, documenting and diagnosing skin cancer can now be completed in minutes with MetaOptima's affordable and powerful platform. MetaOptima's co-founder Dr. Majid Razmara, Skip Capital co-founder Kim Jackson, Skip Capital co-founder Scott Farquhar, MetaOptima's co-founder Dr. Maryam Sadeghi, AirTree Ventures founder Daniel Petre. "We're very excited to welcome proven investors and company builders Skip Capital and AirTree Ventures to our MetaOptima family," said Dr. Maryam Sadeghi, CEO and co-founder of MetaOptima Technology Inc. "Our vision is bold: we want to be in every major dermatology centre and skin cancer clinic in Australia, and we're well on track to making that a reality. With the support of AireTree Ventures and Skip Capital, we're confident our platform will continue to shape and change the state of play for both healthcare professionals and patients." Skip Capital and its co-founders Kim Jackson and Scott Farquhar led the financing round in conjunction with venture capitalist Daniel Petre of AirTree Ventures. "We immediately recognized the potential the DermEngine platform has to radically modernize the dermatology field in Australia. Its ability to provide cutting-edge technology to manage, track and diagnose skin spots will improve early detection rates, which is crucial to melanoma survival rates," said Scott Farquhar, co-founder of Skip Capital and software company Atlassian. DermEngine is designed with the continued insight and support of global key opinion leaders in dermatology, dermatopathology and dermato-oncology. "As experts, we are facing very long waiting lists. 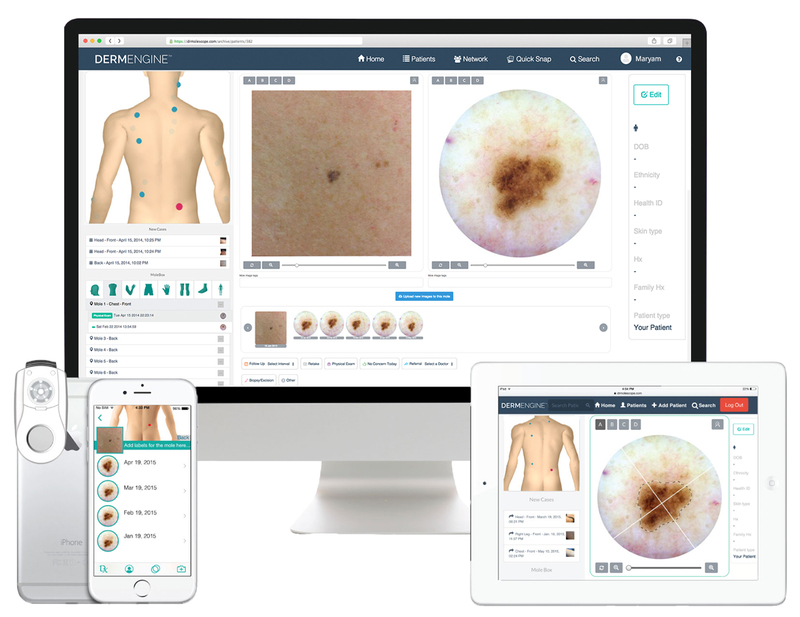 DermEngine and MoleScope create safe, streamlined communications between patients and their doctors, with real integration of all screening tools," said Dr. Pascale Guitera, Associate Professor at Melanoma Institute Australia. Daniel Petre of AirTree Ventures commented: "Scott and I undertook a rigorous global search looking for the leading company that is using AI and image recognition to improve the rates for melanoma diagnosis. MetaOptima, with their DermEngine platform, are far and away the leaders in this space, and we were very pleased to be able to back co-founders Maryam and Majid." Recognized as a growing concern not only in Australia but also around the world, MetaOptima strives to equip all medical professionals with the tools they need to provide optimized care in the fight against skin cancer. For example, over five million new cases are diagnosed in the US each year with an additional 80,000 diagnoses in Canada. MoleScope™ by MetaOptima: The MoleScope device is a smartphone-attachable dermatoscope used to capture high-quality images of moles and help users track changes over time with the free associated app. The device is capable of producing medical-grade quality pictures — the new standard of care in skin cancer diagnosis and management. DermEngine™ by MetaOptima: DermEngine is an intelligent dermatology platform to assist in the imaging, documenting, communicating and diagnosing of skin conditions that works seamlessly with MoleScope™ and other dermatoscopes in the market. DermEngine provides quick and efficient mobile, tablet and web access to images, clinical notes and pathology reports to doctors and patients. Skip Capital is the private investment fund of Kim Jackson and co-CEO of Atlassian, Scott Farquhar. The fund invests across multiple asset classes, with a passion for transformation and technology. Skip Capital backs phenomenal entrepreneurs and teams with deep experience in a sector - individuals who are solving big problems in a rapidly changing world. Skip Capital provides patient, flexible capital from early-to-late stage rounds. Past investments include in sectors such as SAAS, ioT, energy, health, and fintech. MetaOptima is a fast-growing digital health company that strives to empower users with advanced tech to lead a healthier and happier life. Our technologies are MoleScope (a mobile dermoscope) and DermEngine, an intelligent dermatology platform.